This week, I decided to shift gears a little and get back to watching some movies. 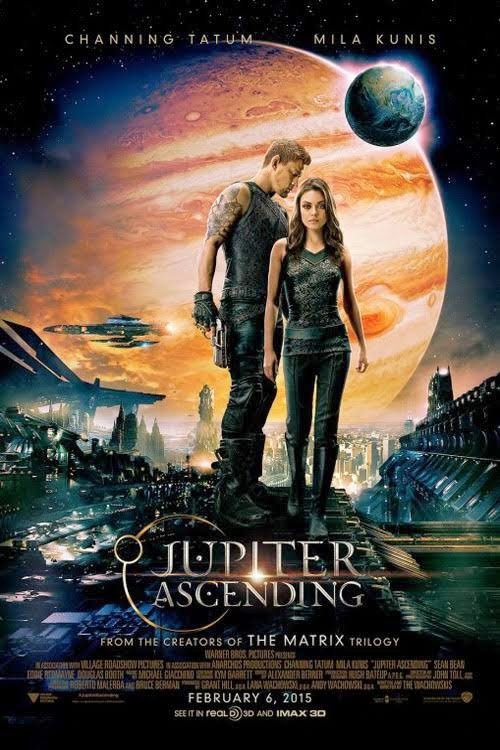 Since sci-fi is a particular love of mine, I thought I'd check out Jupiter Ascending (2015) starring Channing Tatum and Mila Kunis. It's written, produced and directed by the Wachowski siblings. To explain the plot of the film in a single paragraph would be problematic at best. This is actually one of the downfalls of Jupiter Ascending (2015). At it's heart, it's a love story between Jupiter Jones (Kunis) and Caine Wise (Tatum). I won't spoil anything for you, but I'm sure you can guess where a love story between these two ends up. There are barely explained reincarnation issues, family squabbling and backstabbing on a truly epic scale, entire planets owned and willed as part of an inheritance for farming purposes, former soldiers stripped of rank for biting, a boyfriend trying to sell his girlfriend's unfertilized eggs and the scrubbing of many, many toilets. If none of that seems to lineup for you, you've got a pretty good idea why this movie has a hard time finding it's place and defies explanation. The visuals in the film are amazing. The release was delayed 9 months to give the post-production team more time to put finishing touches on the VFX required. You can see exactly where this 9 months was spent. Much of the movie takes place either on huge spaceships or in grandiose palaces on foreign worlds. It's all rendered beautifully. The sound effects are expertly done as well. From a technical standpoint, this movie is great. From a story standpoint, however, this movie is just a mess. Too many ideas shoved into too small of a space, giving short shrift to all. Still, the visuals and action sequences are enough to keep you in your seat until the end. Sure, some of the acting is clumsy. Eddie Redmayne is ridiculously over-the-top and Channing Tatum only has the one facial expression, apparently. Mila Kunis is good but not great and her character seems to be in constant need of rescuing at the very last minute. Whether that's from certain death or just her own very bad decisions. None of the characters are given near enough time for any true development and end up coming across as cardboard cutouts with only the most basic of motivations. If you're bored on a Sunday afternoon and you want to watch a movie that looks and sounds incredible and no sense at all, give this one a try.